Matson Navigation Co.'s unionized container ship workers voted yesterday to authorize a strike if a new contract isn't reached by the end of the month. Labor contracts for every major trans pacific and inter-island shipping compan expire in two weeks. Sailors' Union of the Pacific, which represents merchant mariners, also known as merchant marines or blue-collar workers who steer the vessel, tie down cargo and ensure a ship is in proper operational order, said it hasn't been able to reach an agreement with Matson since formal negotiations began in May. The union said it represents about 2,000 Matson workers, including 200 in Hawaii, who work on container ships that carry between 70 percent and 80 percent of food and supplies from the mainland to the islands. Both Matson and the union wouldn't disclose details of the contract dispute, but a strike vote is part of typical posturing during difficult negotiations. The contract expires on June 30. Matson is continuing to negotiate in good faith with the union and indicated that there was still sufficient time to work out an agreement, according to company spokesman Jeff Hull. However, Charles Khim, attorney for the union, said Matson hasn't made any substantive offer or counteroffer to avoid expiration of the contract and that the union is open to compromise to maintain the steady transportation of goods to the isles. 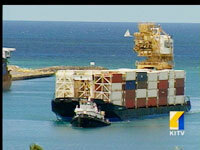 "If these ships stop it'll be dire consequences for Hawaii," Khim said. "We're just loyal Hawaii and U.S. mainland citizens who want a decent wage and living conditions. Matson has made record profits in the first quarter of this year." The union estimates that Matson workers currently earn between $2,000 and $4,000 a month in gross wages alone, not including employee fringe benefits, overtime and vacation pay, which is comparable to the salaries of those in the construction industry. The workers originally secured a three-year contract that began in 2002. That agreement was extended in 2003 to expire this year based on a request from Matson, according to the union.